Are Teeth Whitening Kits Safe? What are the Risks Involved? If you’ve been thinking about purchasing an at-home tooth whitening kit in order to achieve a brighter and more dazzling smile, you’re probably wondering if it will be effective – but that’s not all that you should be thinking about. So, let's answer the question that we all have in our heads, is teeth whitening safe? For most people, whiter results are common and fairly long lasting. But are teeth whitening kits safe? It wouldn’t be very beneficial to have whiter teeth if they’re being damaged in the process. Let’s take a closer look at how whitening kits work so that you can made an educated decision on whether or not they’re the right choice for your needs. What is in a Tooth Whitening Kit? In order for a tooth whitening kit to be effective, the tray holding the whitening material needs to conform to the individual shape of your teeth. This can be done by making your own try with included materials or to take your own impressions (just like a dental office would do) and send them to a company, who will then make you a custom tray. This takes a bit longer but will provide you with a more detailed custom tray. Most whitening gels contain a high percentage of hydrogen peroxide or another tested whitening agent. Less is more when it comes to whitening gel. You’ll only want to apply a thin line of gel throughout the tray and once you put the tray in place over your teeth, quickly wipe away any excess gel that comes into contact with your gums to avoid irritation. Not all kits include this nifty little light but if yours does, be sure to use it. An LED light speeds up the process of the whitening gel. The light should be used for at least 20 minutes for best results. 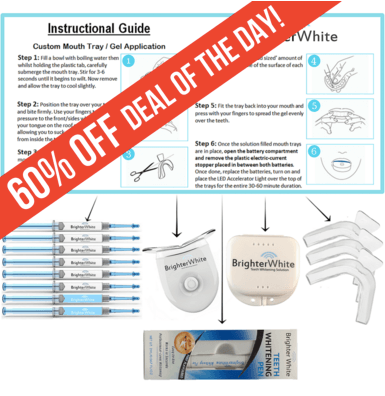 To see a great visual on the use of a tooth whitening kit, check out the following video. While it is specific to one brand, it gives you a great idea of how most tooth whitening kits work. Am I Putting My Teeth's Safety at Risk? Now that you see the included materials of a tooth whitening kit, you can see that the individual components are harmless. The main risk for damage increases when the kits are used in correctly. The experts at Web MD recommend the following tips and guidelines when it comes to making sure that you’re using your tooth whitening kit properly. Only leave the gel on for as long as it says to. Leaving it on longer will not get your teeth any whiter. Instead, you’ll end up with more sensitivity as the gel has longer to penetrate your enamel. Once you finish whitening, avoid certain foods and beverages for the rest of the day. Your teeth are actually more prone to staining right after a whitening treatment so say no to coffee, tea, cola, spaghetti sauce, red wine and any type of acidic food or drink. If your teeth do become sensitive after a whitening treatment, don’t ignore the issue. Monitor the sensitivity and make sure that it improves over the following days. If it worsens, get in touch with your dentist for an evaluation. You should also stop any further treatment until you are cleared for permanent damage. Are There Times When I Shouldn’t Use a Tooth Whitening Kit? For the majority of people, a tooth whitening kit is a perfectly safe and more affordable option for whitening your teeth. But in some situations, tooth whitening kits should be avoided. While the American Dental Association says that the decision to use whitening kits is entirely up to a pregnant woman and her health professional, extreme cautions should be executed. There aren’t necessarily known dangers to the mom or fetus but there isn’t enough data to support the theory that the kits are completely safe for pregnancy. If you really feel that you must whiten your teeth during pregnancy, always speak with your doctor first. If you have any bonded teeth or crowns, it might upset you to learn that these surfaces wont whiten. This will only be an issue if these surfaces are towards the front of your mouth. Molars shouldn’t be an issue but front teeth might. As the rest of your teeth whiten, those won’t, which can leave you with an awkward looking smile. So, is teeth whitening safe? Overall, the verdict is yes; As long as you know how to use one properly, you aren’t setting yourself up for dangerous side effects. Make sure you discuss the idea of tooth whitening with your dentist before proceeding. For more information on teeth whitening, visit this page.